SAN DIEGO - Democratic presidential candidate Sen. Bernie Sanders was in downtown San Diego Tuesday and spoke before thousands of his supporters at a rally at the Convention Center. The "A Future to Believe In Rally" was held at the San Diego Convention Center's Halls D and E.
Sanders brushed off a Tuesday evening primary loss in Arizona, telling thousands of supporters in California that his campaign has won 10 primaries and caucuses and "unless I am mistaken we are going to win a couple more tonight." Sanders was hoping for victories in caucuses in Idaho and Utah on Tuesday night. At the rally, the Vermont senator says there are "record-breaking turnouts" in the three states. Later Tuesday evening, Sanders was declared the winner in Utah. Sanders trails Democratic front-runner Hillary Clinton, but he says his campaign is generating energy and enthusiasm. He was introduced by actress Rosario Dawson at the San Diego Convention Center. She says, "If you want to beat Trump, vote Bernie." 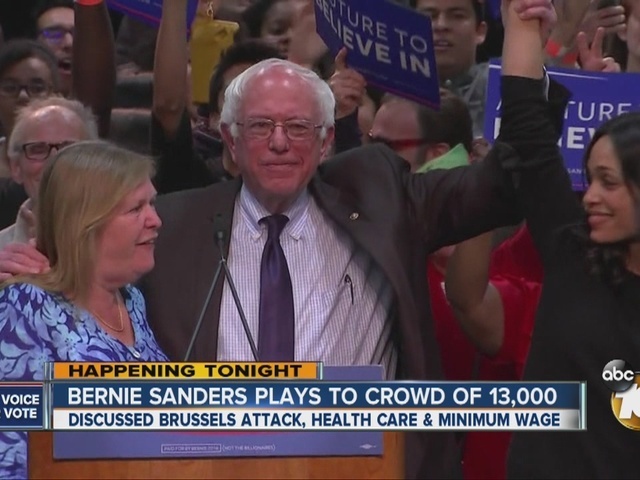 Sanders gives condolences to people of Brussels. "We will stand as a nation with our allies and friends. We'll crush and destroy ISIS." "You can run a winning national campaign without begging billionaires for their money. Clinton has chosen to go a different route." Sanders closing remarks: "If there is a large voter turnout, we will win here in California." Sanders' visit to San Diego came one day after he used an appearance at a Salt Lake City school to deliver the speech he would have given at the American Israel Public Affairs Committee policy conference in Washington had his schedule permitted. The 74-year-old Sanders would be the nation's first Jewish president. He pledged to restart peace talks in the Middle East, a process he said would require "hard but just decisions" to put Israel and the Palestinians on a "path toward peace." "I am here to tell you that, if elected president, I will work tirelessly to advance the cause of peace as a partner and as a friend to Israel," Sanders said. "But to be successful, we have also got to be a friend not only to Israel, but to the Palestinian people, where in Gaza, unemployment today is 44 percent and the poverty rate is almost as high. That cannot be ignored." Sanders also called for a negotiated settlement to the Syrian Civil War. "Those who advocate for stronger military involvement by the U.S. to oust Assad from power have not paid close enough attention to history," Sanders said, referring to Syrian President Bashar Assad. "That would simply prolong the war, and increase the chaos in Syria, not end it."